ArduCAM has developed a new collection of high quality M12 Mount lenses. These lenses have an approximate angular field of view ranging from 10° to 200°. An excellent catalog describing each of these lenses can be downloaded here. 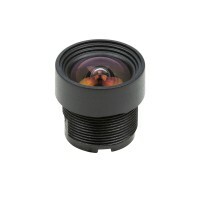 These lenses sell individually, and collectively as a lens kit with a variety of mounting hardware. High quality, low distortion lenses are also available, with an approximate angular field of view ranging from 60° to 110°. Another excellent catalog describing each of these low distortion lenses (including this M27280M07S Low Distortion 1/4″ 2.1 mm M12 Mount Lens) can be downloaded here. For a good introduction to lenses and lens geometry, see the Lenses page on the ArduCAM website. For sample images and videos, see the downloads/Lenses archives, also on the ArduCAM website.